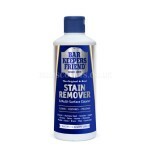 Bar Keepers Friend Original Powder Stain Remover - Surface Cleaner 250g The Original Stain Remover and Multi-Surface Cleaner The oldest cleaning product in the USA! This high performance powder cleaner uses the natural power of Oxalic acid, found in Rhubarb and Parsley. Ideal for c..
E-Cloth Chemical Free Hob & Oven Pack 2 Cloths E-cloth's Hob & Oven Pack is all you need to clean your cooker - tackling grease and heavy cleaning with just water. 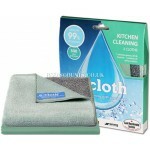 The Polishing Cloth will leave a sparkling finish. Fast and easy Description Hob & Oven Cloth Use the Hob ..
E-Cloth Chemical Free Kitchen Twin Pack Kitchen, Glass & Polishing Cloths Brilliant on worktops, cookers, stainless steel & glass. 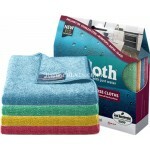 There is no need to struggle with those tough cleaning challenges, when e-cloth's Kitchen Pack provides everything you need to tackle grease and grim..
E-Cloth Chemical Free 4 x General Purpose Cloth Pack A value pack for all your cleaning challenges. This is the pack for all your multi cleaning problems. 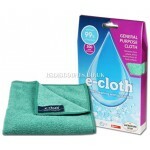 No need to invest in endless amounts of cleaning chemicals; all you need is water and our highly absorbent General Purpose Cloth to mop up ..
E-Cloth Chemical Free 5 Cloth Starter Pack, General Purpose, Polishing, Glass Get started with our revolutionary way of cleaning, at a significant saving. 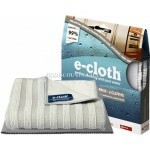 Our two original e-cloths can tackle any cleaning challenge and leave surfaces sparkling, everything you need to understand the power of e-clo..
E-Cloth Chemical Free Dual Sided Stainless Steel Cleaning Cloth Cleaning Stainless Steel has been one of cleaning's greatest challenges, but with this e-cloth it is simply no problem. All you need is water and this cloth to leave Stainless Steel gleaming. 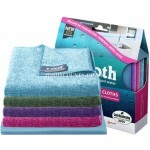 Description Stainless Steel Cloth ..
E-Cloth Chemical Free Dual Sided Washing Up Pad Washing up is no longer a dreaded chore. 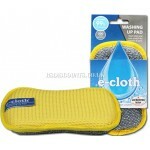 Whether used with or without washing up liquid, washing up is simple, effective and easy with this pad. 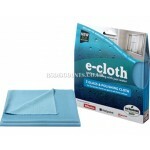 Description Washing Up Pad The smooth side of the Washing Up Pad easily cuts through grease and..
E-Cloth Chemical Free General Purpose Cleaning Cloth One of the two original e-cloths, the highly versatile General Purpose Cloth’s thicker fibres and wedge shape construction rapidly absorb spills and remove dirt, grease and bacteria. You can even use it dry for a quick and easy dust. Use the Gl..
E-Cloth Chemical Free Glass & Polishing Cloth This cloth will give the ultimate finish to appliances, shiny surfaces and glass, as well as being effective at all light cleaning. It absorbs moisture fast and flash-dries to a streak-free finish. Description Glass & Polishing Cloth ..
E-Cloth Chemical Free Glass & Polishing Cloths Twin Pack This cloth will give the ultimate finish to appliances, shiny surfaces and glass, as well as being effective at all light cleaning. It absorbs moisture fast and flash-dries to a streak-free finish. 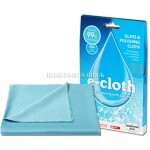 Description Glass & Polishin..
E-Cloth Chemical Free Twin Pack Dual Sided Stainless Steel Cleaning Cloths Cleaning Stainless Steel has been one of cleaning's greatest challenges, but with this e-cloth it is simply no problem. 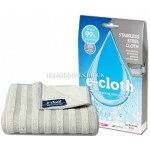 All you need is water and this cloth to leave Stainless Steel gleaming. 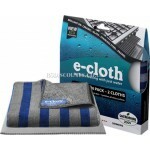 Description Stainless St..
E-Cloth Chemical Free Twin Pack Shower, Glass & Polishing Cloths In order for you to feel sparkling clean, you need a sparkling clean shower and it has never been easier than with e-cloth's Shower Pack. It provides everything you need to keep the shower area and accessories gleaming. Descr..